On Friday, May 29th, Dr. Clayton Lawrence sat down with WJLA as a guest for the Washington Business Report with ABC 7 News National Correspondent Rebecca Cooper. The televised interview with Dr. Lawrence and President Harry Wingo (DC Chamber of Commerce) will air this weekend on Sunday at 9am. 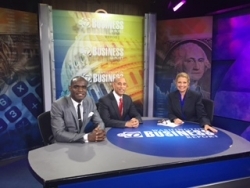 Washington, DC, May 31, 2015 --(PR.com)-- President and CEO of Lawrence Executive Alliance of Professionals (LEAP), LLC, and Chairman of LEAP Foundation DC, Dr. Clayton Lawrence, was invited to be a guest on the local television station WJLA’s Washington Business Report on Friday, May 29th. The invitation came on the heels of Dr. Lawrence’s selection as the 2015 Washington DC Chamber of Commerce’s Small Business Person of the Year. Dr. Lawrence will be honored at the D.C. Chamber of Commerce's Expo and Awards Program on Friday, June 5th, at the Washington Convention Center from 8:00 a.m. – 12:00 p.m. WJLA asked Dr. Lawrence to sum up his thoughts on this accomplishment and the many others he and his organizations received as he prepares to receive the award. To view Dr. Lawrence’s guest appearance on the Washington Business Report in its entirety, please tune into WJLA (ABC 7) on Sunday, May 31, 2015 at 9am. To learn more about LEAP, LLC, and LEAP Foundation DC, please visit www.leap4staffing.com and www.leapfoundationdc.org.